1) In the manuscript the diacritic point is missing from every shin but the first one. (yerushalam), while the manuscript the readable form, the so-called qeri. 3) Ostervald adopted an ingenious "double punctuation" in the third word of the first verse, not used in the Masoretic text. The qamec (a) under the lamed of yerushalayim is followed by a holem (o) above the lamed, thus suggesting an alternative reading of yeru-shalom, where the second half of the word equals to the Hebrew shalom = ‘peace’. Jean Frédéric Ostervald (Osterwald ) was born in Neuchâtel (Neuenburg) on November 25, 1663 in a patrician family, a son of the Reformed pastor Johann Rudolf Osterwald. He studied in Zürich, Neuchâtel and in Saumur; he obtained magisterial grade in 1679. Then he read theology in Orléans and Paris; then he returned home, but soon he left again for Geneva and Dauphiné. Finally he graduated in Neuchâtel in 1683. Here he spent the most part of his life, first as a diacon, then from 1699 a pastor, and finally he was elected deacon. Besides this he gave lectures at the academy of theology. In August 1746 he had a stroke in the pulpit. He died in Neuchâtel on April 14, 1747, after 61 years of service. His pastor's office was inherited by his son Jean Rodolphe (1687-1764). His grandson was the historian and geographer Samuel Frédéric (1713-1795), whose geographical works were translated into Hungarian by István Losonczi of Hányok (1709-1780). Since 1699 Jean Frédéric Ostervald worked on a complete reform of the Reformed church. First he was influenced by the English version of Arminianism ((Jacobus Arminius, 1560-1609), the five articles of faith of Dutch Remonstrants (Remonstrantia, 1610) touching the questions of faith, repentance, grace, human will and universal salvation, by mitigating Calvinist predestination. The Synod of Dordrecht (1618-19), however, has seen the victory of orthodoxy. Ostervald made a step forward, and, together with his two companions in the "Swiss triumvirate" – Jean Alphonse Turrettini of Geneva, and Samuel Werenfels (1657-1740) of Basel – he tried to save the Reformed church from a new dogmatism. His innovative proposals embraced dogmatics, exegesis (his important translation of and commentary on the Bible), liturgy (Bible reading instead of preaching), himnology and moral theology (importance of good deeds and moral life). His writings had a great influence, bearing spiritual renewal or exploding contests among Valdenses, Dutch, German, Hungarian and Scandinavian protestants. Moreover, the English Royal Society for the Propagation of the Gospel in Foreign Parts – of which he was a member – brought his teachings to the countries of the Middle East, India, Canada and the West-Indian Islands. His highly influential oeuvre was later called “the second Reformation”. Some of his works – especially his catechism – were published in several languages (among them in Hungarian), discussed and debated. His diary was also published in 1849. Some of his works: Thes. de rerum naturalium principiis, Saumur, 1679. – Traité des sources de la corruption qui regne aujourd'huy parmi les chrétiens. Amsterdam, Neuchâtel, 1700. A’ keresztyének között ez idő szerént uralkodó romlottságnak kútfejeiről való elmélkedés … Debrecen, 1745. – Catéchisme ou instruction dans la religion chrétienne. Genf, 1702. Katekhismus, vagy a keresztény vallásban való oktatás, mellyet … magyar nyelven ki-adott Kármán Jósef. Pozsony, 1789. – Traité contre l'impureté. Amsterdam, 1707. Neuchâtel, 1708. – La Liturgie, ou la manière de célébrer le service divin … Basel, 1713. – Considérations sur la réunion des protestans … traduites de l'allemand de Mr. Werenfels. 1716. – Ethicae Christianae compendium, 2nd ed. : Basel, 1739. 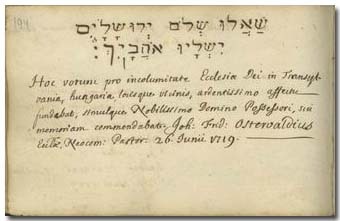 Jean Alphonse Turrettini, the other member of the “Swiss triumvirate” wrote his note in the album of Pápai Páriz a week earlier, on June 19, 1719 (p. 249).